West Nile virus (WNV) is a mosquito-borne infection that can cause serious illness, and in some cases, death. Delaware’s first human case of WNV was confirmed in 2002. During 2003, 17 human cases were confirmed, including 2 deaths. Additionally, during 2003, there were 63 cases in horses. Subsequent to 2003, there have been fewer than 5 human cases confirmed statewide. The chances of a person becoming ill with WNV are small. Most people who are infected with the WNV will not have any type of illness. It is estimated that 20% of the people who become infected will develop West Nile fever: mild symptoms, including fever, headache, and body aches, occasionally with a skin rash and swollen lymph glands. In many individuals, these symptoms are so mild that they go unnoticed or undetected. The symptoms of severe infection (West Nile encephalitis or meningitis) can include headache, high fever, neck stiffness, muscle weakness, stupor, disorientation, tremors, convulsions, paralysis, and coma. It is estimated that one in 150 persons infected with the West Nile virus will develop the more severe form of the disease. Prevention of mosquito-bites is the most important way to reduce your risk of mosquito-borne diseases such as WNV. To help protect yourself from mosquitoes and WNV, wear long sleeves, pants and socks. Consider using insect repellent on exposed skin, and follow label directions. While repellents can be effective at reducing bites from insects that can transmit disease, their use is not without risk of health effects, especially if repellents are applied in large amounts or improperly. There is no vaccine available for humans. However, in 2003 a vaccine was approved to protect horses. Drain or remove items that collect water and provide mosquito-breeding habitat, such as buckets, rain barrels, old tires, blocked rain gutters and unused swimming pools. DEET (the label may say N,N-diethyl-m-toluamide) comes in many different concentrations, with percentages as low as five percent or as high as 100 percent. In general, the higher the concentration the higher the protection, but the risk of negative health effects goes up, too. Use the lowest concentration that you think will provide the protection you need. DEET products have been widely used for many years, but have occasionally been associated with health effects. Skin reactions (particularly at concentrations of 50 percent and above) and eye irritation are the most frequently reported health problems. There have been some reports of central nervous system problems, more frequently reported in children than adults, ranging from slurred speech and confusion to seizures and coma. Products containing permethrin are for use on clothing only, not on skin. Permethrin kills ticks and insects that come in contact with treated clothes. Permethrin products can cause eye irritation, particularly if label directions have not been followed. Animal studies indicate that permethrin may have some cancer-causing potential. Permethrin is effective for two weeks or more if the clothing is not washed. Keep treated clothing in a plastic bag when not in use. If you decide to use any kind of repellent, carefully read and follow all label directions before each use. On the labels, you will find important information about how to apply the repellent, whether it can be applied to skin and/or clothing, special instructions for children, hazards to humans, physical or chemical hazards and first aid. Keep repellents out of the reach of children. Do not allow children to apply repellents to themselves. 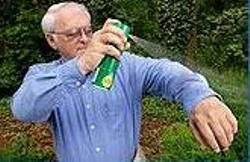 Use only small amounts of repellent on children. Do not apply repellents to the hands of young children because this may result in accidental eye contact or ingestion. Try to reduce the use of repellents by dressing children in long sleeves and long pants tucked into boots or socks whenever possible. Use netting over strollers, playpens, etc. As with chemical exposures in general, pregnant women should take care to avoid exposures to repellents when practical, as the fetus may be vulnerable. MOSQUITO CONTROL: Contact the Delaware Department of Natural Resources & Environmental Control (DNREC), Mosquito Control Section.